In preparation for competitive events, swimming coaches prescribe a pre-competition warm-up, typically an active, pool-based warm-up. The effectiveness of a warm-up strategy is determined by the intensity and duration of the swimming and dryland elements, as well as the time between warm-up and the onset of the race, the transition phase. Completion of an active passive warm-up strategies can enhance subsequent exercise performance. These in enhancements in performance are in part, attributed to elevations in muscle temperature. A ~3ºC augmentation in muscle temperature elicits a measurable increase in both muscle fiber conduction velocity and power output. An active warm-up, can also prompt a ‘speeding’ of oxygen uptake (VO2) kinetics and induce a postactivation-potentiation response. In addition, the warm-up period is recognized as an opportunity for athletes to mentally prepare for an up-coming event by providing time to concentrate on the task ahead..
A number of experimental studies have examined the influence of various warm-up strategies on swimming performance, but no observational or self-report information exists pertaining to the actual pre-competition warm-ups used in elite swimming. The aim of this study was to describe the current pre-competition warm-up practices in swimming and identify contemporary issues faced by elite swimming coaches and their athletes within the competition environment. The data for this study were collected via a self-administered questionnaire consisting of eighteen questions including nine multiple choice and nine open-ended questions. Forty-six currently practicing swimming coaches based in Australia (n = 43), Britain (n = 2) and Canada (n = 1) participated in the study. All recruited coaches were required to hold a minimum of a State-level coaching license to participate in the investigation. The mean coaching experience of the respondents was 18 ± 11 years. 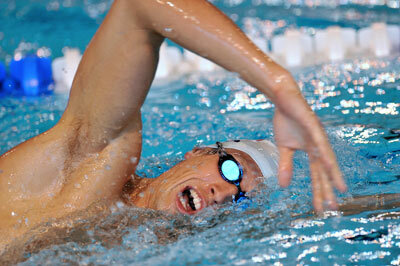 The typical age of the swimmers (coached on a weekly basis) was 15-21 years. Coaches were asked to provide specific information about the pool warm-ups they prescribed for the 100, 200 and 400 m freestyle events in terms of the volume, intensity and recovery for each particular stage of the pool warm-up. The coaches also described any dryland-based warm-ups they employ and any external factors they felt could alter the potential benefits of pre-competition warm-up. All fixed response and closed-question data was analyzed using frequencies to determine the percentage response from the cohort of coaches. Coaches identified four key objectives of the pre-competition warm-up: physiological (elevate body temperature/muscle activation), kinesthetic (tactile preparation, increase “feel” of the water), tactical (race-pace rehearsal) and mental (improve focus, reduce anxiety). The typical volume of the pre-competition pool-based warm-up for the 100 m race distance was 1440 ± 660 m which was less than that of the 200 m and 400 m race distances (1650 ± 670 m). The total pool warm-up prescribed for the 200 m race distance was also less than that of the 400 m. During the pool warm-up, coaches requested their swimmers utilize additional devices such as kickboards (14%), pull buoys (11%), hand paddles (14%), fins (8%), snorkels (8%) or a combination of these devices (46%). In between swimming efforts, various rest intervals were prescribed, with the majority of coaches prescribing 30-60 sec (40%) or 1-2 min (46%) rest periods. To monitor warm-up intensity, the coaches reported using split times (13%), heart rate (9%), stroke rate (13%), stroke count (9%), as well as swimmer’s own perceived maximal exertion (9%), or a combination of these measures (48%). The majority (78%) of coaches prescribed a dryland-based warm-up exercises, involving stretch cords and skipping, lasting ~15-20 min on the pool deck in addition to the pool-based warm-up. The coaches requested that this dryland-based warm-up be completed either prior to the pool warm-up (86%) or during the transition phase (14%). These dryland warm-ups were reported to be completed in a small space, typically on pool deck. During the transition phase, coaches reported that their swimmers typically changed into their race swimsuit and a tracksuit and relaxed while sitting down and listening to music. Swimmers spend 18 ± 8 min undertaking these activities and following this, the coaches reported that swimmers enter a marshalling period which lasts ~15-20 min. The majority of coaches believe the optimal transition duration is ≥ 30 min (46%), with others stating that 20 min (13%) or 25 min (11%) was optimal. The majority of coaches reported that their swimmers utilize their pre-competition warm-up prior to specific race-distance time-trials conducted within training (54%), prior to benchmark or test sets (20%) or just in general training sessions prior to the main set (13%). Some coaches (13%) also reported that their swimmers practice using their race warm-up in each training session in the three weeks prior to competition, during the taper phase for example. The information provided in this study is useful for coach education purposes by informing trainee swimming coaches about the practices of their elite counterparts and strength and conditioning coaches and sport scientists about the situational factors coaches and swimmers face within the competition environment. McGowan CJ et al. (2016) Current warm-up practices and contemporary issues faced by elite swimming coaches. Journal of Strength and Conditioning Research.